I kindly inform that the Annual Report of the President of the Office for Registration of Medicinal Products, Medical Devices and Biocidal Products for 2017, which constitutes an annual statement on the activities of the unit under my management, has been issued. The bilingual, Polish-English, printed annual report is submitted to the Minister of Health, under Art. 25 of the Act of 6 September 2001. Regulations implementing the Act – Pharmaceutical Law, Act on Medical Devices and Act on the Office for Registration of Medicinal Products, Medical Devices and Biocidal Products. It is standard for European agencies dealing in particular with the registration of medicinal products and medical devices to exchange information concerning the activities performed, including annual reports, which constitutes an accepted practice in this regard and is a part of the transparency policy and transparency of actions. The annual report of the President of the Office includes a summary information on the annual statutory activities of the unit in the areas of registration of medicinal products, veterinary medicinal products, medical devices and biocidal products. 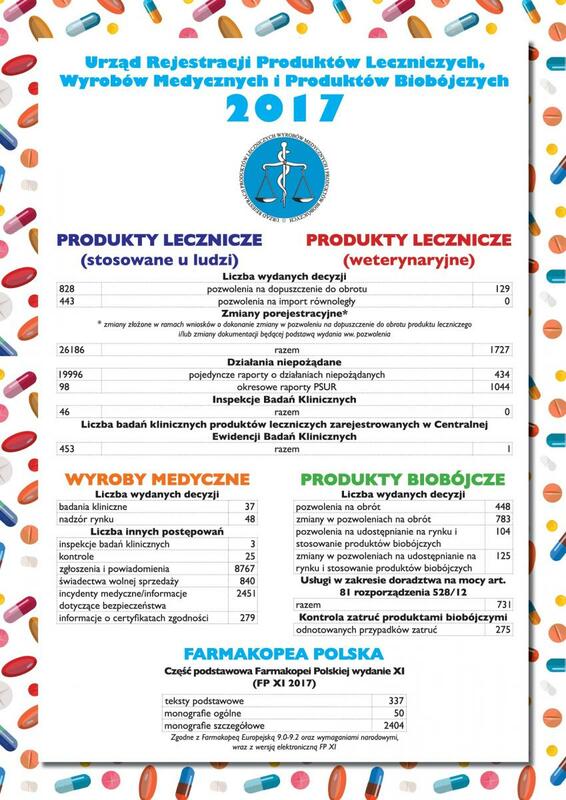 In addition, the Annual report contains data concerning trials of medicinal products (including veterinary medicinal products) and medical devices as well as the control of the system for monitoring the safety of medicinal products (including veterinary medicinal products), Polish Pharmacopoeia and activities in the field of international cooperation. In addition, the document contains information on financial, staff, organisational and administrative issues of the Office, as well as on the information activities implemented as part of the "Safe Medication" campaign led by the Office. I encourage you to read the publication and wish you an enjoyable read.